Today's Mama Style Monday features not only one of my own favourite outfits right now, but also one of my favourite of Tyne's summer outfits too. This is one of my favourite outfits at the moment as I think its suitable for going from daytime to casual-dressy for a meal out without much needing to be changed. It also ticks my major box of concern when dressing at the moment....comfort! 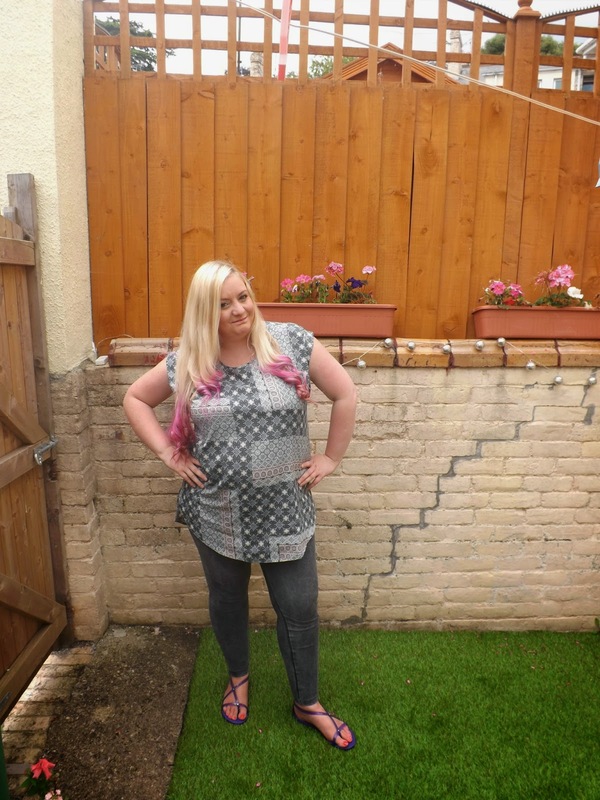 You'll notice a theme through my Mamastyle Monday posts....Kaftans, longline tunic tops, jeggings in every colour and leggings are my items of choice! They are pretty much all I wear apart from the occasional maxi dress or maxi skirt! 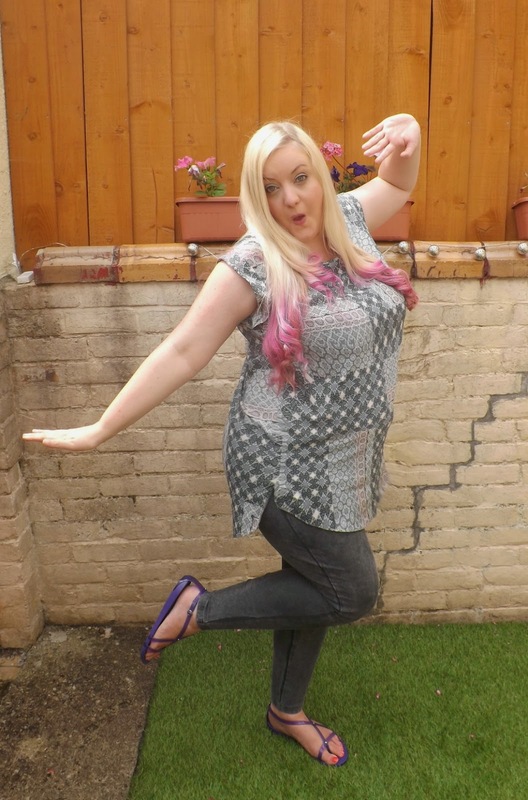 I love the unusual pattern in this particular longline top and the pink & grey colours. Pink & grey is one of my favourite colour combos of all time, which is probably why this appeals to me so much - I wear the top mostly with these grey jeggings as they are so incredibly comfortable! 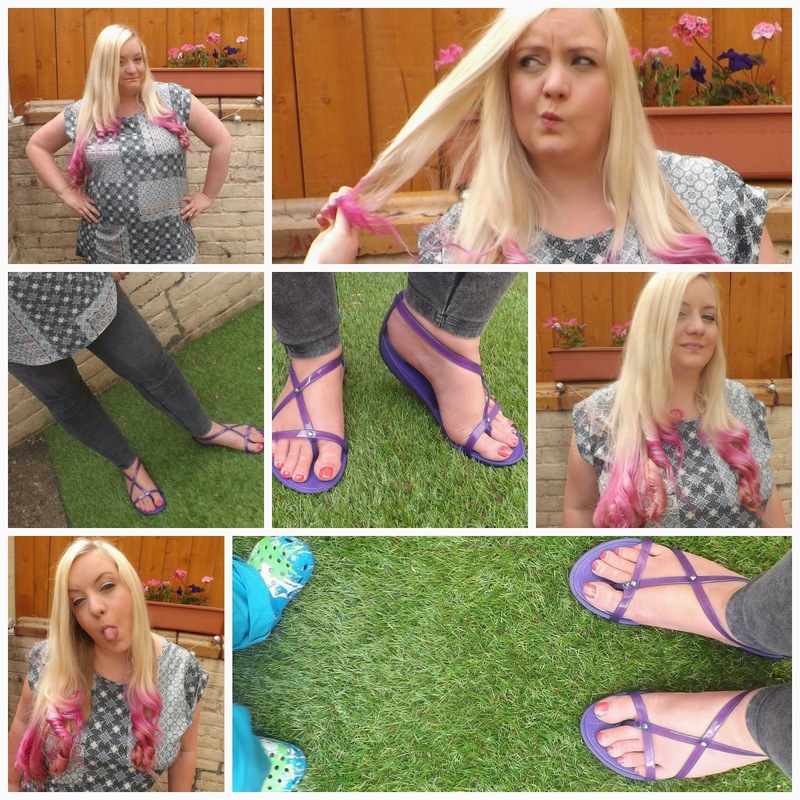 I'm still loose curling my hair most days using the Nicky Clarke curling tongs I reviewed a while ago....they are without a doubt one of my favourite finds of the year! They probably don't match perfectly with the purple crocs I'm wearing here, but the Crocs are SO COMFORTABLE that it's impossible to care! I was very kindly sent the Crocs to try out, and I have to admit I was apprehensive...I have never owned a pair of Crocs before and have heard many a joke made at their expense...but these look nothing like I imagine Crocs to look, and they are hands down the most comfortable pair of shoes I have ever owned! It's like walking on little fluffy clouds...but purple ones made out of a jelly-shoe like material. These are just too adorable and again they look incredibly comfortable! Tyne is not at all a fan of keeping shoes on and immediately tries to remove them as soon as you force him into them, but he quite happily modeled the Crocs and didn't try once to remove them! I think they went so perfectly with this little summer outfit of his, which is one of my favourite things for him to wear on sunny days....I just think it's so sweet and "Little Boy"ish! Infact on the day these photos were taken we went out to a nearby model village (Post on that tomorrow!) where we walked around for over an hour, and Tyne happily kept the Crocs on for the entire time! Aargh, stupid auto correct! Naturally I meant Tyne! I love your hair, what do you use to curl it? Also Tyne look's so summery! 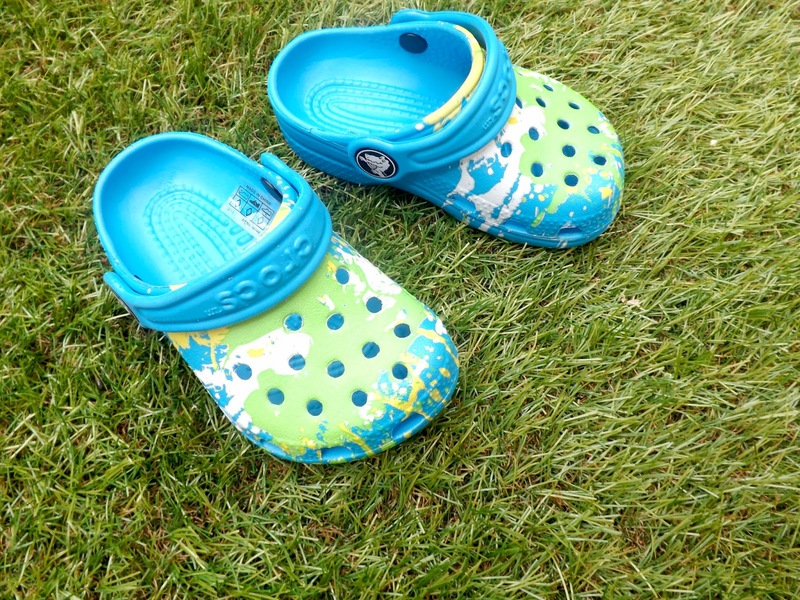 I don't care what people say about crocs....My girls live in them during the summer! 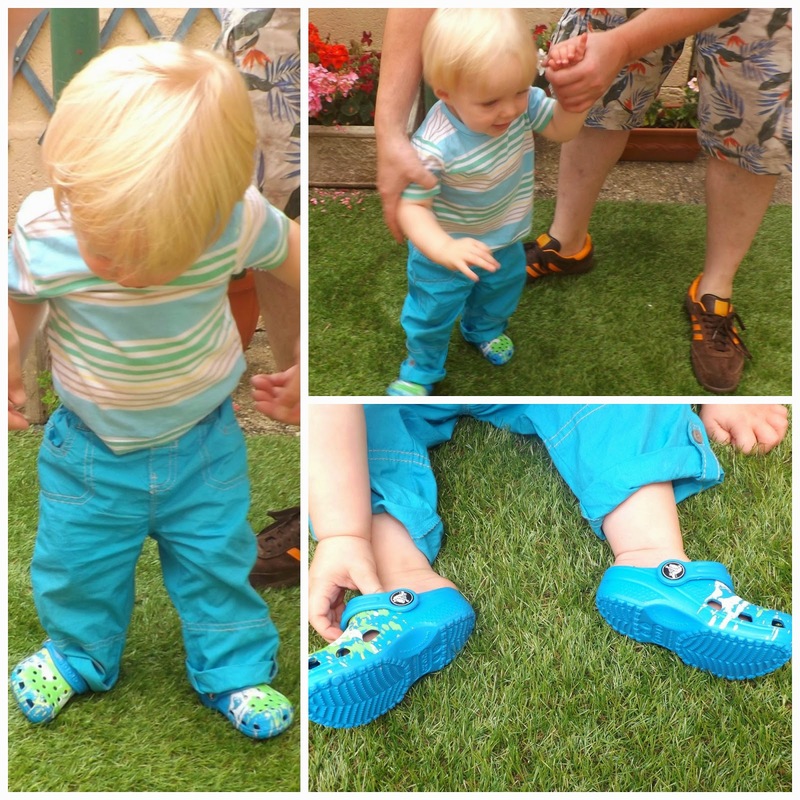 i am really not a crocs fan (i think they're a bit like marmite!) but yours are gorgeous!! !